Our first year with free range chickens and a fall garden wound up being a year without any fall produce. So the following spring, we found a cheap and quick way to keep the chickens out for the year. The mesh fencing worked, it kept them out. But it is really hard to weed around and it was going to have to be replaced every year. This year I wanted to do something a little more permanent and stronger. I found some table pallets at Spring Lake Family Farms and was hoping we could figure out a way to use them for the fence. (Spring Lake used to be a garden nursery. All of the nursery items were still there, and we've been cleaning it up and rebuilding it into an aquaponic farm.) I called them pallets, but really they are frames of 2x4s with snow fencing attached to make a table surface. Jeremy did not relish my idea to use the very large, very heavy table pallets as a fence around our garden. But he did find a couple of rolls of leftover snow fencing! This is snow fencing. It is also used at the beach for dunes. The rolls Jeremy found were 6ft tall, and we aren't sure how long they were. But when we stood up the fence, it was huge! Taller than me, and I got a little worried that they would block too much sun, or be easily pulled down by the wind. So we looked at them, and there was a wire that ran right down the middle. We got out the circular saw, and vroom all the way down. Voila! We have two 3ish feet tall fences. This actually solved two problems. The 6ft tall fence was not long enough to go around the whole garden, but we had plenty at 3 ft tall. Well, not quite voila. Jeremy used his handy dandy little hand saw to take care of any pieces that didn't get cut through with the circular saw. We wrestled the fence up to the first t-post and attached it using metal hangers. Then we started around the rest of the t-posts. Each time we came to a t-post, we would hook up Jeremy's come-along to the next t-post to stretch the fence as tight as we could between each post. We only clipped the come-along to the bottom half of the fence to get it the tightest. The come-along needs to attach to the bottom of the t-post for the most stability. Since the fence is really quite stretchy, it's best to just pull the bottom because the top will pull down toward the ground. When we got to the end of a fence roll, we'd attached the next fence using the same metal t-post clips overlapping a couple of slats, and then just kept going. You'd also need a good pair of pliers for this project to twist the clips around. Overall, it was a pretty easy project, once we figured out how to do it. It took a couple hours. 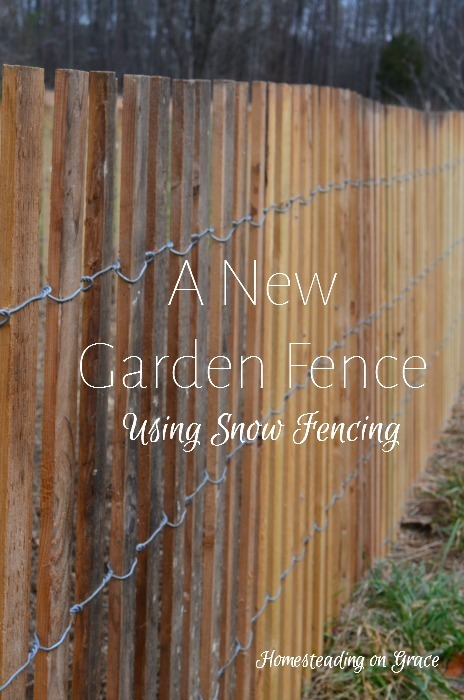 I haven't found 6-foot snow fencing, but I have found 4-foot snow fencing online. (That's not an affiliate link, but it's the best price I can find.) It looks pretty cool, too, if you ask me. It's kind of got a beachy, rustic theme. The gate is just left over fencing. It's bendable, and if we ever get around to it, we'll add a little hook to close it. Now the big question is, does it work? Yep, it keeps the chickens out. They don't like jumping up to it because it moves so easily. So even though they could, they haven't. It's also pretty handy for keeping the littles in the garden when we're working. And since we're using hay to bury the weeds, we can push the hay all the way to the fence to cover the grass that tries to grow through it. We've had it for a month or so now. And I love it. We got a ton of splinters putting this fence up! Or at least, I did. I must have soft hands, which means I'm a bit of wimp. But it looks fantastic. Good deal! It looks great & though I love chickens, I don't love what they can do in the garden. 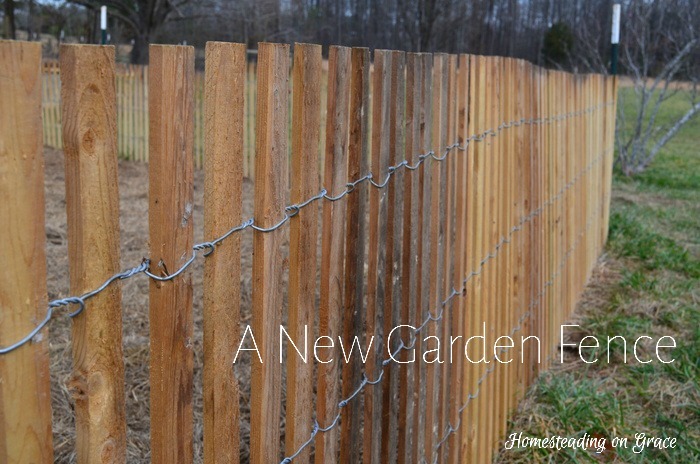 I love the idea of putting this around my raised beds! We don't have chickens this year (but I've had them before and will again probably next year). However, our goats get loose sometimes, and guess where they head first? I'll put hubby on the look out for this fencing. I came up with this same idea, and when I googled it I found this blog post. Looks great! Thanks for sharing.